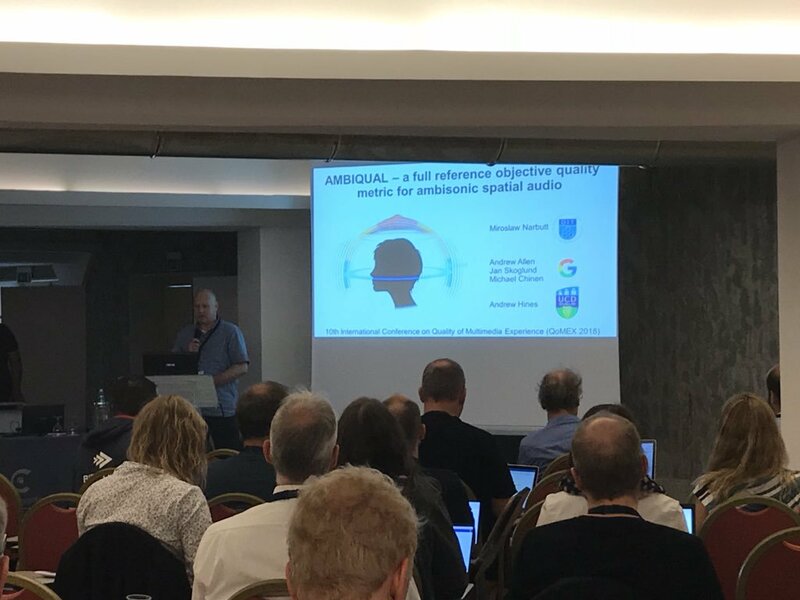 QxLab’s Dr Miroslaw Narbutt presented work on an objective spatial audio model for compressed ambisonic quality estimation. The paper received an honourable mention in the best paper awards. Andrew also presented the winning bid pitch to host QoMEX in Ireland in 2020. Mirek explains that “people often hear things before we see them”. Content creators need spatial audio to deliver immersive VR. 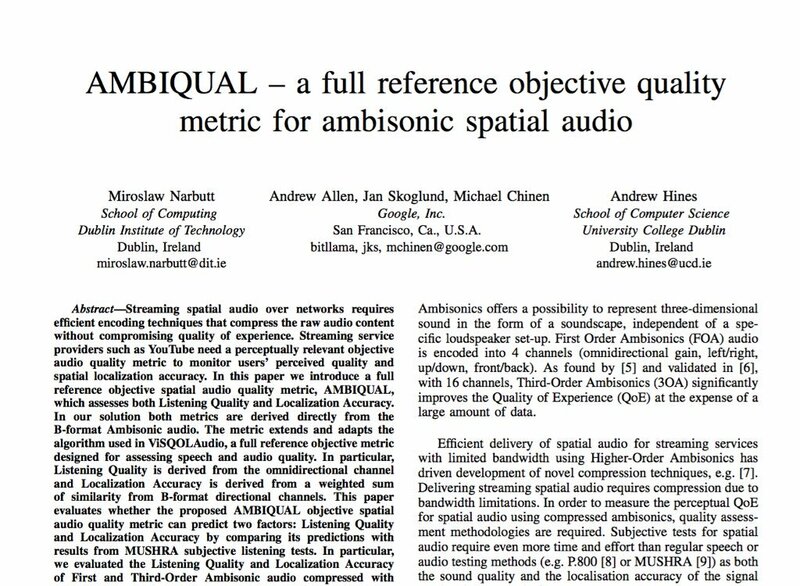 Introducing AMBIQUAL: a tool to predict quality for compressed spatial audio. The SFI CONNECT Research Centre for Future Networks, represented by QxLab’s Dr Andrew Hines (CONNECT Funded Investigator at UCD), has won the 2018 US-Ireland Research Innovation Award in the category of ‘Research Centre with links to the US corporate sector in Ireland’. Read Irish Times coverage here. 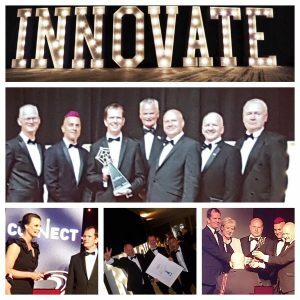 The award was jointly presented by the Royal Irish Academy and the American Chamber of Commerce to recognise excellence in research innovation. The announcement was made on Friday, 18 May at the American Chamber of Commerce annual dinner at the Clayton Hotel, Burlington Road, in Dublin. The event was attended by the Minister for Business, Enterprise and Innovation, Heather Humphreys, T.D. ; the President of the Royal Irish Academy, Professor Peter Kennedy; and members of the US-Ireland business community. Andrew’s project is a collaboration with Google and is called ViSQOL, a software platform for evaluating audio quality on the web by “looking” at sounds. It can predict sound quality in a wide range of internet scenarios from streaming music and video conferencing to virtual reality 3D spatial audio. Based on previous research undertaken by Andrew to examine how speech would sound from different hearing aids, Google have supported the development of this research innovation to examine its application in video-conferencing. The result is ViSQOL: a software platform that can predict sound quality in a wide range of internet scenarios including music, video streaming, video conferencing and virtual reality 3D spatial audio. Andrew’s work spans several research projects from his time as a postdoc in Trinity College Dublin, as a CONNECT Funded Investigator at DIT, and now in UCD.